ALMATY (Tengrinews) – Kazakhstan, the world leader in uranium production, is reporting a new record for uranium output. As of the end of 2012, uranium production output in Kazakhstan made up 20,900 tons, KazAtomProm National Nuclear Company’s Press Service reports. In 2011 the figure stood at 19,450 tons (almost 9% up against 2010). Tantalum production output made up 213 tons, with niobium production standing at 43 tons and beryllium production standing at 2,526 tons. Kazakhstan retains its title of the uranium production leader as it supplies about 37% of uranium to global markets. The global market’s capacity is estimated at 55,700 tons. In 2011 the country’s share in global uranium supplies stood at 35%. KazAtomProm, including its stakes in other companies, produced a total of 11,900 tons in 2012 (over 20% of global production). In 2011 the Company produced 11,079 tons. KazAtomProm’s exports in 2012 totalled 9,260 tons. Kazatomprom head Vladimir Shkolnik has said Kazakhstan plans to boost its output of uranium to as much as 25,000 tonnes by 2015. 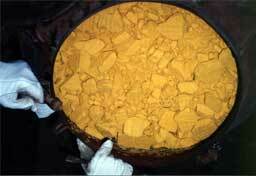 Kazakhstan sells most of its uranium to Asian countries such as China, South Korea, Japan, and India. Kazakhstan, which holds more than 15% of global uranium reserves, second only to Australia, surpassed Canada in 2009 as the world’s largest producer. Currently, the country has no nuclear power stations and does not use any uranium byproducts but has embarked on a program to provide materials for the entire nuclear cycle – from raw uranium to nuclear fuel and reactors. President Nursultan Nazarbaev on January 23 gave the government one month to submit proposals for construction of a nuclear power plant in Kazakhstan.